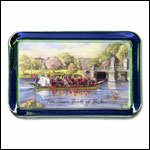 The Boston Glass Paperweight features the view of Boston from the Charles bordered with a carefully selected color to complement the print. Each paperweight is created by pouring hot molten glass into a mold by hand. This natural age-old molding process imbues character-rich variations and irregularities in the glass. Similar paperweights, almost identical in size and shape can be found in antique shops all over America. Ours will become the antiques of tomorrow. Until then theyll be a treasured addition to any desk. Felt bottom. 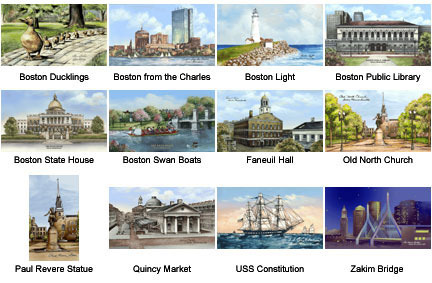 The standard image, "Boston from the Charles" (shown above), is available to ship within one business day. 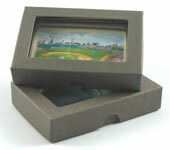 The additional images shown below are available for shipping within 5 business days. Optional personalization also adds 5 business days to the availability.